Bollywood hunk Salman Khan, who is once again playing a cop in his brother Arbaaz Khan's debut production "Dabangg", says he has a special connect with police as his grandfather was a police officer and, of course, due to his own run-ins with the law. "I think because my grandfather was deputy inspector general (DIG) of police, Indore, I have this special thing for the cops. I have also shared a very long relationship...!" Salman told IANS with a laugh. The actor spent time in jail in 2002 after his car allegedly ran over four people sleeping on a footpath. He once again went behind bars in 2007 in Jodhpur on charges of hunting an endangered deer. 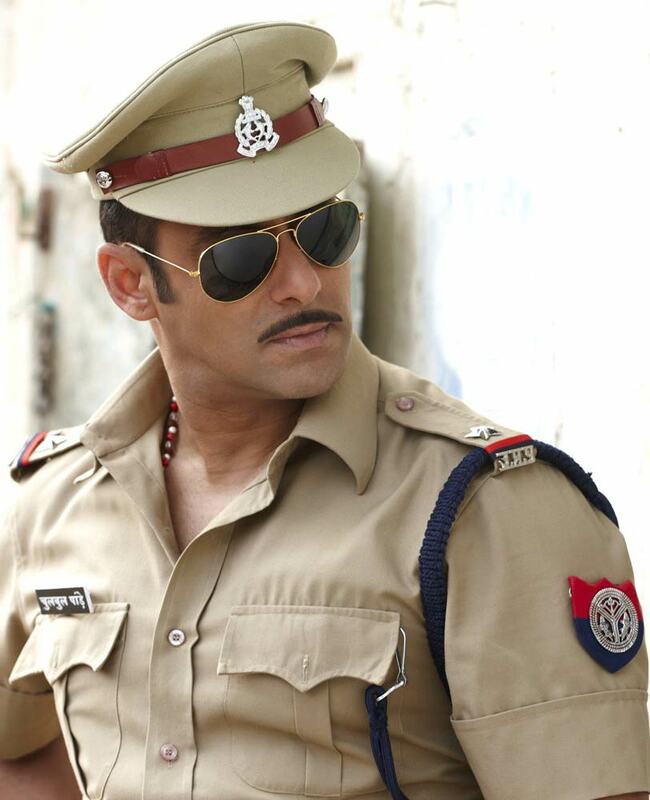 Salman, 44, has played a policeman in several films like "Wanted", "Garv" and "Auzaar". He started out in 1988 with the film "Biwi Ho To Aisi". Salman gets philosophical when he says a star's image is something created by others and if an actor himself starts believing in that image, then he is done for. "When you think that you are a normal person, you are not a star; then you don't get impressed by your image that 150, 200 or 500 people have created and crores of people have appreciated that image; if you don't believe in that image of yours and you know for a fact that is not you but a created thing, you will be fine. If you start believing in that image of yours, then you are done with," Salman told IANS in an interview. Known for his beefed up muscles, the actor said he lost weight for "Dabangg". "I lost a lot of weight and then it looked weird. You are playing a cop who is totally ribbed. I really wanted to look ribbed in the film," said Salman. Salman had grown his hair for "Veer", a look he really liked, and now he sports a moustache for the new flick, which also stars Shatrughan Sinha's daughter Sonakshi. He admits he was a bit apprehensive about going for an image makeover this time. "I had just finished 'Veer' and I had to cut my hair very short... I didn't want to. The long hair was looking good. It took so long to grow them; so I didn't want anyone to cut them off." About the moustache, Salman said: "Five-six months before the film, Arbaaz used to come with different kinds of moustaches every week. I said I'm shooting for a film, can I grow a moustache...Somewhere Sonakshi also had this thing for her dad's moustache. If you see my moustache, it's somewhat like his only," he laughed. Funnily, Salman is seen doing some really weird dance steps in the songs of "Dabangg". Why is that? "Actually in this film, I copied everyone who can't dance. There is a nightclub-dancing style, there is one dancing style when you are in a function, and one dance is when you are drunk and enjoying yourself. This film is dedicated especially to those people who can't dance," Salman told IANS.